On March 11, 2011, the eastern part of Japan suffered from devastating damage due to an M9.0 earthquake and an induced tsunami. The tsunami was especially devastating to three prefectures near the epicenter — Iwate, Miyagi, and Fukushima. An important factor on disaster response of this disaster was that three prefectures were simultaneously impacted. Until the Tohoku earthquake, Japan had not experienced a multiple prefecture disaster since the Disaster Countermeasure Basic Act was established in 1962. Even the Kobe (1995) and Niigata (2004) earthquakes only affected one prefecture, the Hyogo and Niigata prefectures, respectively. Due to the large-scale nature, disaster response coordination among the affected prefectures was crucial, and the role of the national government became more important. Another challenge about the Tohoku disaster is responding to a cascading disaster. In addition to impacts from earthquake and tsunami, the national government had to concurrently deal with another urgent issue, the nuclear power plant accident in Fukushima. The national government is responsible for responses to nuclear power accidents, while local governments are responsible for responses to natural disasters. Consequently, cascading disaster caused confusion about national government response because Japan did developed a response scheme to cascading effects of disaster or the simultaneous occurrence of two events requiring national action. And now a long term recovery is a critical issue about this disaster. Number of impacted communities and societal issue in this area such as aging and depopulation makes the effort of recovery difficult. 227 municipality governments simultaneously struggle recovery project (figure 1). And all the scheme of national government subsidies for recovery was set up for growing society in 1970s, and it does not work well for recovery in shrinking age. People say that “Community battles with new issues on recovery by very old fashioned tool”. These three are present issues about response and recovery in Japan. However, the Tohoku earthquake is moderate size of disaster for Japan. Japan is expecting to be hit by mega disasters such as the Tokyo Metropolitan Earthquake and the West Japan Earthquake disaster near future. Economic loss from the Tokyo Metropolitan Earthquake is expected to be JPY112T, and that of the West Japan JPY220T by the worst case scenario. Annual budget of Japanese central government is JPY90T and the expecting loss of those disasters is huge. This paper discusses about history of Japanese disaster reduction and how Japan works to be resilient to expecting mega disasters reflecting lessons from the 1995 Kobe and the 2011 Tohoku earthquake. How has Japan been adapting to earthquake disasters? Japan is an earthquake prone country and the largest earthquake disaster in modern ear of Japan was the Kanto earthquake in 1923,which gave huge impact to Tokyo, and killed more than 100,000 people. A building collapse and a big fire killed many people, and the policy of Japanese disaster management has targeted a damage mitigation, such as constructing earthquake proof buildings, and preventing a big fire by good land use policy and fire proof buildings. So engineering was main tool for disaster reduction in Japan. Mitigation oriented disaster reduction policy continues up until the 1995 Kobe earthquake. Challenges about the 1995 Kobe earthquake were disaster response and individual recovery, especially housing recovery. Japanese disaster management is mitigation or engineering oriented, and we are not prepared for response, relief operation. And during the era of Japanese economic revitalization after WW2, seismicity in Japan was not active, and we did not revise our disaster response scheme since 1960s. Basis of Japanese disaster management system was set up in 1961 with the disaster counter measures basic act, which was developed from the lessons of Ise Bay Typhoon. And for relief operation, the system was established in 1957 and did not make any major revision. So the 1995 Kobe earthquake was the first experience of large scale disaster response for Japan as a developed country. Setting up of emergency operation structure was delayed, and relief operation did not work well. Another issue was individual recovery. More than 450,000 families had severe damage totheir houses, butthe number of insured housing was very small. Housing recovery became a big challenge for the recovery from the Kobe earthquake. From the lessons of the Kobe earthquake, “the victims support act” which pays maximum JPY 3M was established in 1998. After the 1995 Kobe earthquake, Seismicity in Japan became active. We experienced the 2000 Tottori, the 2004 Niigata, the 2007 Noto, and the 2007 Niigata. Those earthquakesoccurred in rural area, and the impact was limited. But government support became generous. And in 2001, a M9 earthquake hit Tohoku area, and induced tsunami washed away communities in sea side, and accident at the Fukushima nuclear power plant No.1 caused serious contamination of radiation. It killed almost 20,000 people mainly by tsunami, and almost 260,000 housing got major impact. However, number of impacted family is smaller than that of the Kobe earthquake. Emergency response and relief operation were big challenges for the Kobe earthquake, and new issue called “individual recovery” was emerged. Researches[i] about individual recovery were conducted by social scientists. Those researches found out that individual recovery consists of seven elements such as housing, social network, community, disaster preparedness, mental and physical health, financial situation, and government assistance. And we also found out that it needs at least ten years to complete a life recovery, and process of life recovery consists of five phases such as disorientation, formation of impacted society, disaster utopia, back to normal life, and rehabilitation, which changes based on logistic scale as 10hr, 100hr, 1,000hr. Economic recovery was another issue about recovery in Kobe. Three basic economic recovery patterns were found[ii] such as immediate boom and following slump, immediate slump and following recovery, and immediate slump and no full recovery. Building construction business corresponds to immediate boom and following slump pattern. Soon after disaster, there are many recovery works but construction business will simultaneouslylose their future business because all the building in impacted area will be renewed, and no more construction work remains for a whole. Daily consumption type business such as food business corresponds to second pattern. They will reduce their sales because of depopulation in the impacted area, but with the recovery of population, their business will come back to the normal situation. And final pattern corresponds to port business. Businesses which have competitors would lose their business opportunities because competitors will take over their business during business interruption for disaster. Amount of dealing amount of containersin Kobe port never came back up until 80%. Main target of the recovery projects in Kobe was housing. Kobe has successfully completed the recovery of commuting communities by completing their housing recovery within five years. However, economic recovery did not go well, especially business with competitors such as heavy industry and port business, and smallbusinesses such as chemical shoes. Disaster gives the largest impacts to the weak points of community and economies. Heavy industry and small business had problems before the disaster. Those existed issues were revealed by adisaster impact. Tohokuwhich experienced a M9 earthquake had many shrinking communities. Sendai, over million city is only growing city in Tohoku. Resilience in this area was very lowfrom the view point of demographic distribution in the impacted area, because number of younger generations who would work as a core of revitalization or recovery of communities was very small. Disaster usually causes depopulation. In case of the Kobe earthquake, almost 100,000 people left impacted area soon after disaster, but the population of Kobe were more than one million and could attract people, and the population of Kobe came back to the level of pre-event within ten years. Impacted communities in Tohoku were shrinking communities, and disaster accelerates depopulation. Unusual depopulation has continued for eight months (figure 2). Those who left communities were younger generation. It gives long lasting impact to resilience or sustainability of a community. Migration of younger generation after disaster could have changed the democratic structure of impacted communities to that of 2030s, an aging community.The migration could be caused by the delay of business resumption. Recovery planning of prefecture and municipality governments has been completed within eight month. However, detailed land use planis not fixed even after one and half year. To make land use plan, they should complete tsunami simulation and get consensus among stakeholders.It needs time to make a good plan, but delay of planning makes trouble about business resumption. People cannot decide whether they can resume their business at the original place or not, and they have to decide to move out from the impacted community to resume their business operation as fast as possible. In case of the Kobe earthquake, detailed land use was made public within three month. The reason why they could make land use plan within such a short period is that they had idea of redevelopment in the city from before the earthquake. Goal of land use change of Tohoku recovery is reconstructing a safer city against tsunami. So a buffer zone is set along the sea side, and a residential area will move to higher ground. Lower ground will be used only for business. Two level of tsunami were used to set land use plan such as the level 1 and the level 2. Level 1 tsunami is decades to one hundred years interval tsunami, and level 2 is several hundreds to one thousand years interval tsunami. Tsunami disaster reduction policy is set corresponding to two level of tsunamis. Policy for the level 1 tsunami is “prevention”, and government construct sea wall to prevent tsunami inundation at the time of the level 1 tsunami, and that for the level 2 is “mitigation”, government set buffer zone regulating residential use of land, and develop evacuation procedures for those who work at sea side. 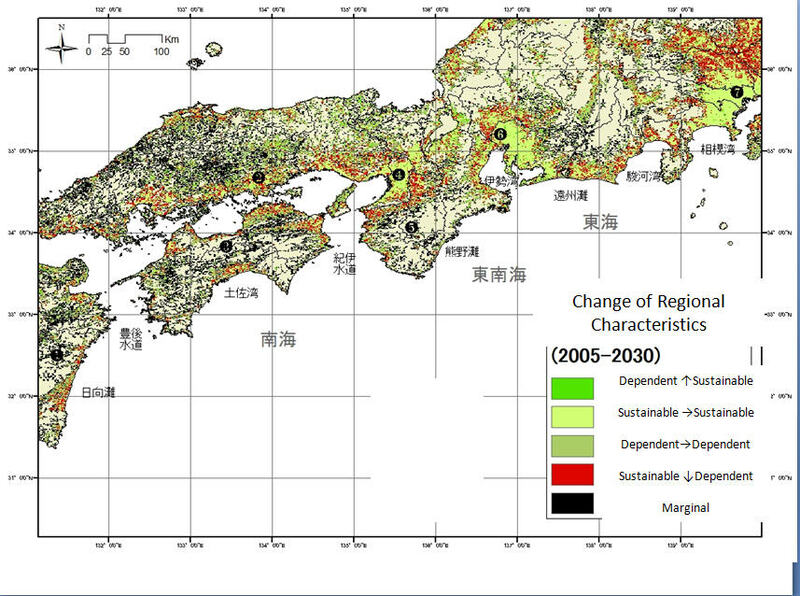 There were two strategies of land use change to prepare for the level 2 tsunami. One is the relocation of residential area to higher ground, and the other is making high mound to sea side and the area on the mound will be mix land use of business and residential. In Tohoku, the relocationstrategy was used for recovery of small fishing villages, and the mound type strategy was for urban area. Implementation of mound type recovery delays because many stakeholders were involved, and people are anxious about safety living near from the sea. For Implementation body of recovery projects, national government set up the Recovery Agency locating in Tokyo with several branches in the impacted area. The recovery agency works as a one stop center of recovery projects, because subsidiary schemes of each project belong to each ministry. The role of the recovery agency is a budget allocation. Main body of recovery operation is a municipality government. Municipality governments of small community deals with recovery projects including recovery of water supplies, road, temporary housing management, land use change. As mentioned before, those municipalities were a shrinking community, and did not have human resources to manage new projects. So the lack of human resources in municipality governments is critical issues for recovery operation. Now each municipality government work very hard to complete their recovery project described in their recovery plan with the assistance of staffs from local governments from all over the Japan. However, it needs at least three or five years to complete the recovery project from now. And more people will leave the impacted communities to find the job. It needs time to develop good recovery plan, but delay of recovery means the depopulation in a community. Are there some good ways to resolve this problem? Only way to resolve this issue is having recovery plan before disaster to save the time of planning and consensus building. Pre-disaster recovery planning is the key for establish resilient communities against disaster. How Japan respond to Mega disasters to be resilient? Japan faces the high risk of mega disasters both in Tokyo and pacific coast of western part of Japan where economic activities concentrate, and possible loss by those disasters exceeds annual budget of Japanese central government. In addition to natural hazards, Japan society faces societal crisis of depopulation and aging (figure 3). Recovery in growing period is not difficult because economic growing induces urban and rural development, and those developments can synthesize with recovery. However, recovery in shrinking community is difficult task as happening in Tohoku. Preparing for disaster with post disaster development or revitalization plan of communities is only way to survive from mega-disasters in the ear of shrinking Japan. Vision of pre-disaster reduction plan need to be integrated with the future vision of the community. The vision should be coordinated with adjacentmunicipalities also. People in the possible impacted area begin to think about the importance of pre-disaster recovery planning but they are still work for emergency planning for saving their lives. And the relocation of municipality buildings is discussed to maintain the operation of government at the time of emergency. A relocation of municipality government building can be the good opportunity to kick off for pre-disaster reduction planning. With the relocation of municipality government buildings, they should think about the plan of vulnerable community where the municipality government buildinglocate, and the relocation site where is the possible resettlement site after the disaster. Norio Maki is Associate Professor in Disaster Prevention Research Institute, Kyoto University (Japan). He works on disaster reduction and long term recovery planning, and has also published on housing recovery, including Housing after Natural Disaster; Peoples Migration and Disaster (in Japanese) (Kajima Press, 2012). This implies that general “worst case” planning may have generic economic growth projections–and it may not be taking aging and depopulation trends into account. As you point out, a disaster preparedness regime fixated on structural mitigation might miss some of these needs–a flood in a thriving community affects the population and the economy quite differently from that in an economic challenged region. The paper helpfully points out that new emergency preparedness agencies and planning strategies are underway. I wonder, how will such initiatives be assessed? How closely is the public paying attention at this point? Has the profession of emergency management grown post-Tohoku? This essay caused me to think more than I have before about what it means to live in a highly-populated nation where major seismic events are guaranteed to happen. In California, people seem to be able to practice denial, but that doesn’t seem to be possible in Japan. Again I’m reminded of Beck’s concept of “social risk positions.” It’s likely that the most risky localities are disproportionately inhabited by people who do not have the economic means to live elsewhere– so those people live with increased risk. But your essay made me realize that those same people live with another risk as well–their communities may be more poorly equipped to recover when a disaster strikes. So it’s a doubly-risky position. Looking at the endnotes for this paper, I noticed your references to general linear model analyses of recovery. I’m wondering about questions of accuracy, reliability, and robustness in those models. How good do the models need to be to support effective recovery? How well can the models capture the range of possibilities that exist in disaster scenarios? We would expect any pro-disaster modeling to be helpful, and better than no modeling at all. But what are the limits on how helpful the models can be? And if they turn out to be very inaccurate or blind to certain possibilities, can that result in disaster planning that serves the community poorly? I think the frameworks for thinking about recovery issues here are very useful starting points for categorization and analysis. I do have an observation and several questions, most specific to Japan. I find it fascinating that in an effort to promote resilience in the future, data accumulation and planning seem to be concentrated in just one location, and a high-risk one at that — Tokyo. Given that even duplicate sets of records (population registries, koseki tohon, and other local tax documents, etc.) were lost, I would have thought that administrators would have not only diversified locations of records, but administrative personnel as well. Have I just missed something or is this “unresilient” pattern I describe actually been followed? 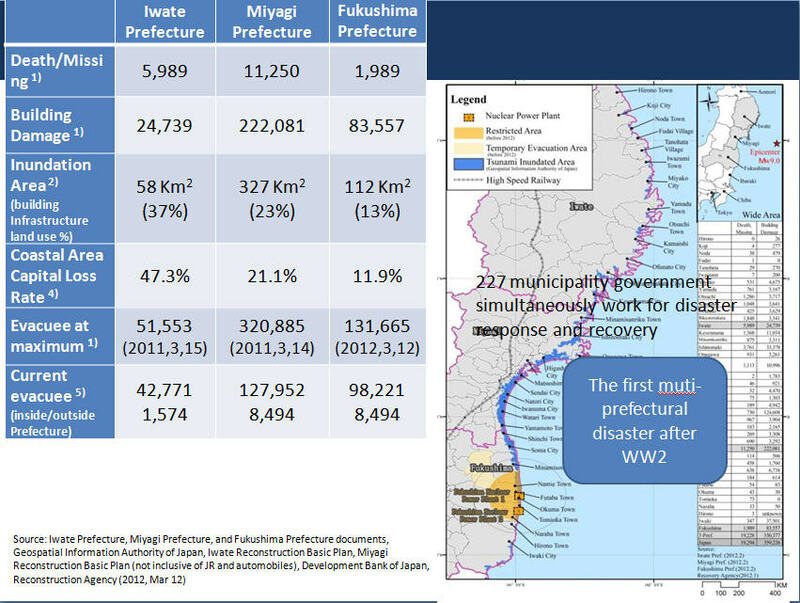 1) I was puzzled by the discussion of multi-prefectural disasters since 1962. My recollection is that there have been numerous devastating typhoons that have damaged multiple prefectures. E.g., 1990, taiphoon 19 (Flo) killed 42 people across much of central Japan. Was the damage here so limited that aid from the national government was not needed? Is that the critical administrative distinction that is involved here rather than an event’s impact on more than one prefecture? 2) Do people think of 3-11 as unusual in that it was a “cascading” disaster? Is it really just the “cascading” element that is unusual or is something else in play here? For example, earthquakes typically involve not only direct damage to human populations, but spark additional disasters, tsunami, fire and landslides the most common. 3) How much explicit discussion is there in Japan today regarding how much investment to make in areas (like many of the Tohoku districts damaged by the tsunami and earthquake) that have been losing population for decades? In an American context, someone would explicitly raise the issue of whether huge investments in economically declining parts of the country could be justified. 4) I find it interesting that after 1957 and 1961 there were not significant revisions of code, despite the fact that there were major earthquakes such as the 1964 Niigata event (7.5). Were these earthquakes in generally less populated areas, and therefore people did not pay as much attention to them as with Kobe/Awaji? Another instance of “discrimination” vis – a – vis rustic populations? I think this paper is very good and brief introduction for thinking the disaster in the Japanese context. And it is very important to think variety of issues for recovery from the 3.11 and directions for future disasters. I totally agree with the idea of comparison Kobe case and Tohoku case. What kinds of different and common points exists between Kobe and Tohoku case? What kinds of issues were revealed by differences? 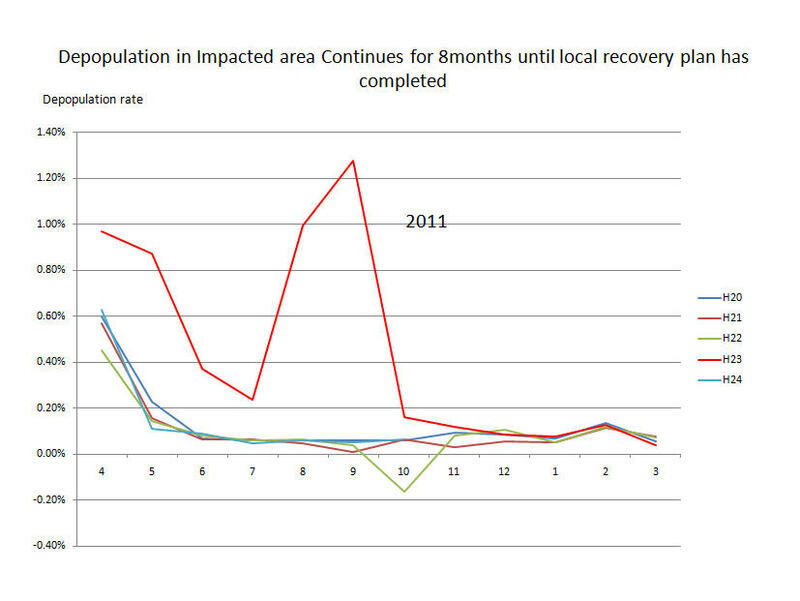 How different characters of each municipalities affect their recovery process? Maybe, the way of distribution and amount of social interests and resources will be related key-point. I think it is valuable to think dynamics between national frameworks and local practices, considering Maki’s discussions. 3.11 except pre-disaster recovery planning? I appreciate your point about the consequences when different levels of government (local, prefectural, national) are assigned responsibility for responding to different sorts of disasters (natural, nuclear) in a situation like 3.11, which crossed the “natural”/nuclear divide. You mention that some people consider the current form of recovery subsidies an old-fashioned tool that is not well suited to an age of shrinking populations. What changes would they like to see in recovery policies? If it takes 10 years for a “life recovery,” then areas with many elderly face a sort of time challenge that most disaster recovery planning doesn’t seem to take into account. I appreciated this paper for providing a nice summary of Japan’s experience of learning and adaptation from pre-Kobe, post-Kobe, pre-Tohoku and to post-Tohoku. I wonder if you could elaborate more on the importance of “preparing for disaster with post disaster development or revitalization plan of communities.” I agree that “vision of pre-disaster reduction plan need to be integrated with the future vision on the community,” but at the same time it is not easy to think about how that could be implemented, given the fact that disasters like 3.11 – a “black swan” that goes far beyond our imagination – will happen again in the future. How do you envision pre-disaster recovery planning to take place? Are there any region in Japan (or elsewhere) that you observe as having such a plan? Reading your paper, I wondered if you have an example from another context or another country that you would consider as ‘best practice’ for ‘pre-disaster recovery planning’. Also, it would be interesting to hear more about the precise ways in which individuals are involved in this planning at the moment in Japan. Thank you for your comment. Tokyo metrpolitan government is working for their pre-disaster redevelopment plan. Maki Sensei, as you mention, Tokyo has done a fair amount of pre-disaster recovery planning, hazard mapping, and so forth, but I would like to know what kind of pre-disaster recovery planning activities are going on within the region threatened by seismicity in the Nankai Trough? Also, how do you distinguish between “pre-disaster recovery planning” and planning for disaster risk reduction or mitigation? Wouldn’t the two have considerable overlap? I am really impressed your in site survey. I will meet you in Kobe. Interesting assessment of recovery planning, why and when it will work. The contrast in recovery processes mobilized by the nuclear power plant disaster and the ad hoc manner in which plans are initiated without being really tested bears further study.